I grew up in the era when modern medicine was worshipped and trusted completely. If I ran a fever we ran to the drugstore. If the fever persisted we ran to the doctor. The doctor prescribed antibiotics and the cycle continued. I never thought to question this method of treatment-it is the standard mode of thinking. You feel bad, go to the doctor and they will give you something to make you feel better. Isn’t that basically what we do? Unfortunately I think this sends the wrong message to children. We are unknowingly training them to seek “feeling good” from drugs. Is it any wonder we have problems in our society with addiction? What if the next time you or your child has a fever you let the body do it’s job? Remember, fevers over 105 degrees are rare. Have you ever had one that high? We are always scared and focused on the worst-case scenario, but these don’t occur very often. We have been trained to believe that our bodies are weak and that we should not trust our own innate intelligence. And so we pop pills. Tylenol, Advil, Pepto, Tums, Zyrtec, the list goes on and on. But do these pills make you healthy? Or do they cover up symptoms and make you “feel good” so that you can continue doing the things that caused the problem in the first place? Your body is amazing! It has the potential to heal itself and it is constantly working to keep everything running inside you. Taking drugs to cover up or stop these processes is a bad idea. Of course there is the emergency situations where drugs and surgery are necessary, but again, these are rare. When you have a headache, it is not because your body is deficient in Tylenol. Think about that. You might be dehydrated, lacking sleep, or just stressed out. Instead of popping a pill and banging away at whatever you were doing, why not take some time out and drink, rest, and relax. Take care of yourself. 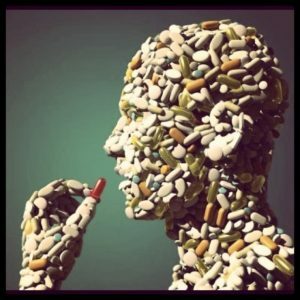 Excessive pill popping is a side effect of our go-go-go lifestyles. It isn’t healthy. 16,000 people die every year from taking so-called “safe” drugs like Tylenol. You can look this information up on the CDC’s website. Yet we start our kids on these pills from the moment of birth. It is no wonder we are seeing a rise in a myriad of health issues. Remember, there is always a trade-off in decisions you make that affect your health. A Tylenol today could mean kidney dysfunction tomorrow.